They say people who live in glass houses shouldn’t throw stones, but that’s a minor sacrifice to make for this windowful condo. No, that wasn’t a typo. An architectural marvel with soaring ceilings and floor-to-ceiling windows can only be called one thing: windowful. Look for it in an upcoming edition of Webster’s, because one look at this place and they’ll see the word is necessary. 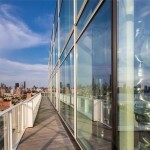 The light-flooded loft contains 4,500 square feet of interior space and an additional 1,800 square feet of wrap terrace, in case the glass obstructs your view of Manhattan’s skyline or the Hudson River. This indescribable pad has a few wow factors, so we’ll take you through the contenders. For starters, let’s look at the 30×40 foot great room with its 21-foot ceilings and double-paned windows. 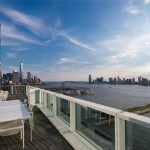 When friends come to visit you can literally ask them if they’d prefer to sit overlooking the river or the skyline. And it’s not just guests who get to have all the fun. Those days of feeling like the host or hostess stuck behind the kitchen counter while your friends have all the fun are over. 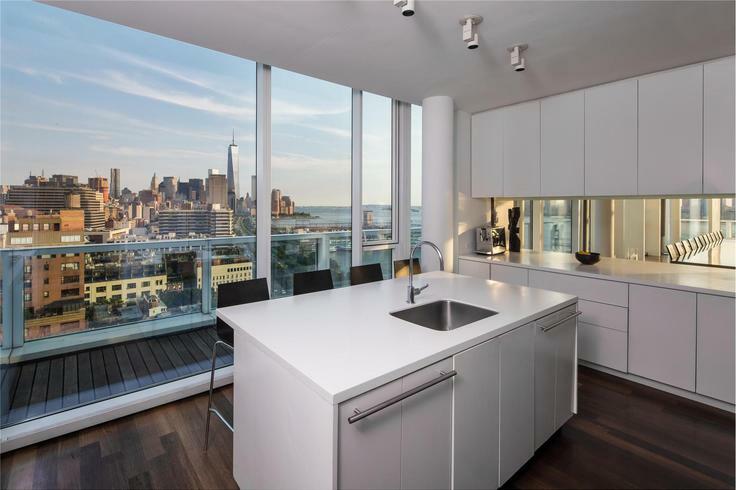 Who wouldn’t want to cook with a view of the Manhattan skyline complete with One World Trade Center chillin’ in the background? 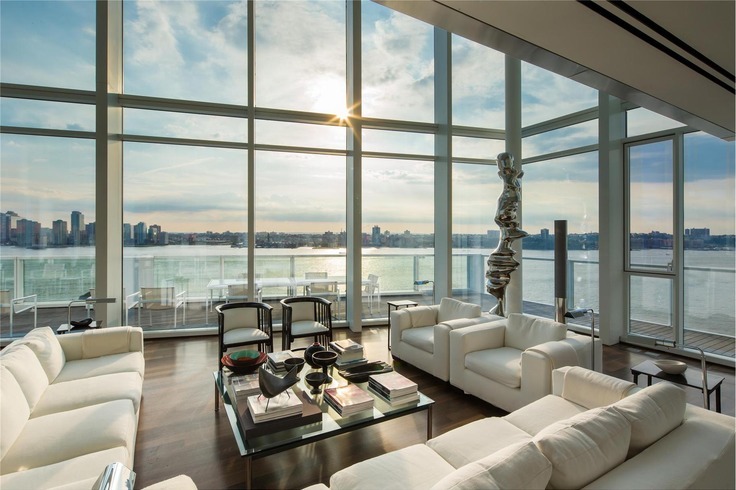 A view like that would make any kitchen appealing, even if it weren’t custom designed by Richard Meier himself. But of course it is. Oh there are more contenders for this home’s piece de resistance. Split bedrooms with marble en suites and walk-in closets vie for the spot on the lower level of this apartment. Their resumes come complete with stunning views of the Empire State building and One World Trade Center. But as thrilled as your guests will be to stay in such luxurious rooms, the twins are going to have to settle for Miss Congeniality in this pageant because the views from the master suite are incomparable. This master is such a prima donna it needs the entire upper level. And this diva doesn’t have a more photographic side as river and skyline views meet surround her. She knows that while other apartments claim to have spa-like baths, you’ve never known a real bath until you’ve taken one overlooking the Manhattan skyline at night. 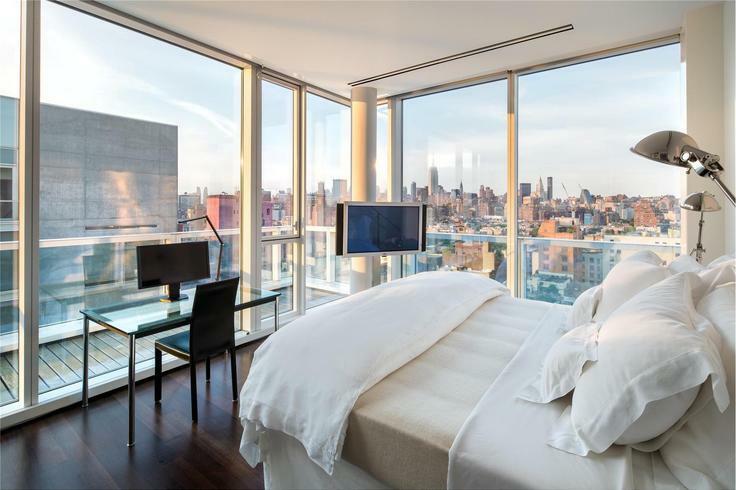 Sure, she’s a diva, but a master suite that can provide privacy while still putting the city and river at your feet is perfection personified. No, there are no winners for the star of this apartment. That title will be reserved for the owner, who will not only be able to brag about life in the lap of luxury, but will also enjoy all the amenities of this landmark building, namely 24-hr concierge, a fitness center, professional screening room, and a double-height atrium with a 50-foot infinity-edge pool. Who would dare sell this enviable pad? The penthouse’s current owner Louise Blouin, one of the U.K’s richest women, is possibly looking to unload the place to settle a few debts. Well, we pooled our money together to see if we could purchase the place from under her–you know, as our charitable deed for the day–but it turns out $35 million is just a smidge outside our price range. However we would like Douglas Elliman’s Raphael De Niro to pass along a message to whoever the new owners might be. We will house sit any time.